I set myself this goal way back when I was picking components for my PC (see the CPU section), when I got the idea while reading up on VT-d and IOMMU. Back then, these guides were making waves. I actually tried this in the past already, but back then – after compiling kernels & qemu etc.. – I hit a driver packaging conflict between the Nvidia and Intel drivers. Now it’s possible to install the Nvidia drivers together with the Intel drivers (the former with and the latter without OpenGL support), so I came back to this project. I mostly followed the instructions on the Arch Linux PCI passthrough via OVMF wiki page and correlated it with information on the VFIO tips and tricks blog (this seems to be the place where people migrated after the massive thread linked to earlier got closed). Install the Intel Graphics driver, but without mesa and mesa-libgl. Ensure that my GPU’s vBIOS supports the UEFI Graphics Output Protocol (GOP). As I had an MSI card with a vBIOS that did not support the UEFI GOP out of the box, I had to request a UEFI GOP firmware on their forums. Setup the VM as explained in the VFIO GPU How To series, part 4. Note that I am no longer required to compile custom kernels or qemu! I also setup PCI passthrough for an extra Intel PCI-express 1G NIC I acquired in preparation for this; this pretty much worked out of the box: I setup the vfio driver to take control of the NIC at boot time similar to how these instructions do it for the graphics card, and then use the virt-manager GUI to add the PCI host device representing the NIC to the VM. [Update 24 Jan 2016] I only managed to get PCI-passthrough to work using the i440fx chipset, using the Q35 chipset resulted in the devices not starting up in Windows (code 10 in the device manager if I remember correctly). 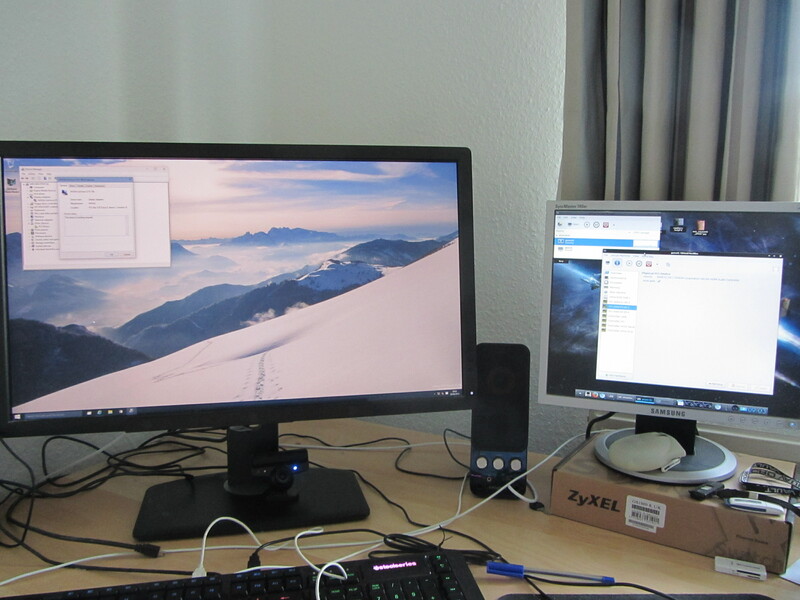 Here’s my PC showing qemu/libvirtd running a Windows VM controlling the left screen via my Nvidia 760GTX, while the right screen is controlled by my onboard Intel i915, running the Linux host. This puts the VM performance in 3DMark 11 at 95% of the native performance. Note that this isn’t a perfect comparison, since the OS is different, the VM got 2GB less RAM and I left my browser running in Linux. I also had to manually set the CPU topology in qemu to match what ‘sudo virsh capabilities’ reported. I’d like to use my second SSD as the storage backend for the VM, ideally in such a way that I can boot the system installed on that SSD natively and inside a VM (like you can on a Mac using VMWare Fusion and bootcamp). Currently I just created a Windows 10 VM stored in a raw file on my primary SSD. I have to switch UEFI CSM off to boot Linux, and on to boot my Windows Server 2008r2 (setup so that it’s basically Windows 7) partition. I think if I uninstall the Intel driver this issue should go away again as well, but that would be going in the wrong direction! :). To resolve this issue, I’m likely to upgrade to Windows 10, which has better UEFI support. Thanks for leaving a comment! I’ve followed up re: booting the Windows VM from a disk, see my next blog post for details: Installing windows for both native and virtual machine use.